Picture Framing Blog - A Good Frame of Mind: Happy New Year! Let’s Frame It Up! I hope you all had a happy and exciting holiday. Ours was lovely, and spent close to home due to the web conversion American Frame completed on December 27th. I cannot tell you how grateful I am for your support and feedback during the process. It allowed us to thoroughly de-bug our system during the ‘soft-launch’ period and now we are up and running. When you love what you do, the lines between ‘work’ and ‘play’ can become blurred, so although we ‘worked’ over the last few weeks, I can say we are truly recharged and ready to jump into 2014. I’m confident, as artistic types, you know exactly what I mean. The typical self-improvement pledges just aren’t as compelling as the goals we set for our art. 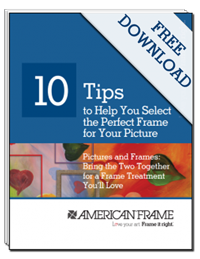 American Frame’s goal this year is to launch a new tradition and declare January ‘National DIY Picture Framing Month’. Unfinished projects? Let’s get them done. Always wanted to figure out canvas floating? Group displays? Now is the time. Pull out photos and artwork long tucked away and get them on the walls. In addition to our new website, watch for daily posts and quizzes on Facebook and Twitter. Chime in on the conversation and be eligible for our daily FREE give away—a copy of our award winning DIY Framing Fundamentals Book. Does a National DIY Framing month sound like a good idea to you? Let us know—because we are here to make framing fun, easy and satisfying. Let us know what you need, and we’ll do our best to bring it!